The cotton candy method will help us realize that nothing in this world is static and that happiness, instead of being sought, must be created. Each of the seven steps in the book will allow us to connect with our emotional life and learn to differentiate between feelings, thoughts and emotions to create new models of existence. Using this method we can address life situations such as existential emptiness, the difficulty of adapting to external reality, denying our feelings, the tendency to postpone decisions, victimhood, aggressiveness, impatience, passivity, fear, mental rigidity or resentment, in order to make a huge shift in our lives. Remember the feeling you had when you were a child and enjoyed cotton candy? That’s where you’ll return to, to your childhood, to that state in which happiness is simply about living in the moment. 7 steps to definitive happiness. 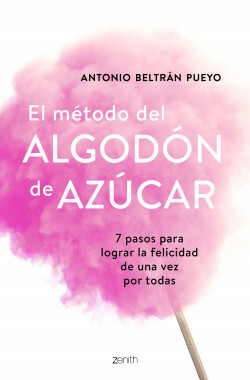 Antonio Beltrán has designed a proven method that has helped hundreds of people transform their lives and make them simply happier. It’s highly practical and straightforward and reviews the most common situations that tend to generate unhappiness and teaches us how to overcome them.